A Donald Trump stint as host of “Saturday Night Live” on television this weekend has sparked numerous protests across the U.S. beforehand and will trigger the Federal Communications Commission’s equal-time rule afterward, but it’s unlikely to do much to help the billionaire real-estate mogul’s U.S. presidential quest. The GOP candidate is locked in a heated battle with the retired neurosurgeon Ben Carson for the top spot in Republican opinion polls. A joint CNN/ORC poll released Friday gave Trump a slim 2-point edge over Carson in Iowa’s GOP caucuses, while a joint NBC/Wall Street Journal poll released Wednesday gave Carson a 6-point lead over Trump in the national Republican race. Meanwhile, Trump personally rejected a “couple” of proposed “SNL” skits because they were “too risque” and risked alienating Iowa voters, he told Fox News’ Bill O’Reilly Friday. But the reality-TV personality said the show would make for “a great evening” and that parts of it would be “really great,” Variety reported. Trump’s appearance on “Saturday Night Live” is mired in controversy. A leading member of the activist group Move On likened the presidential candidate’s appearance to a “90-minute campaign ad,” the Wall Street Journal reported. 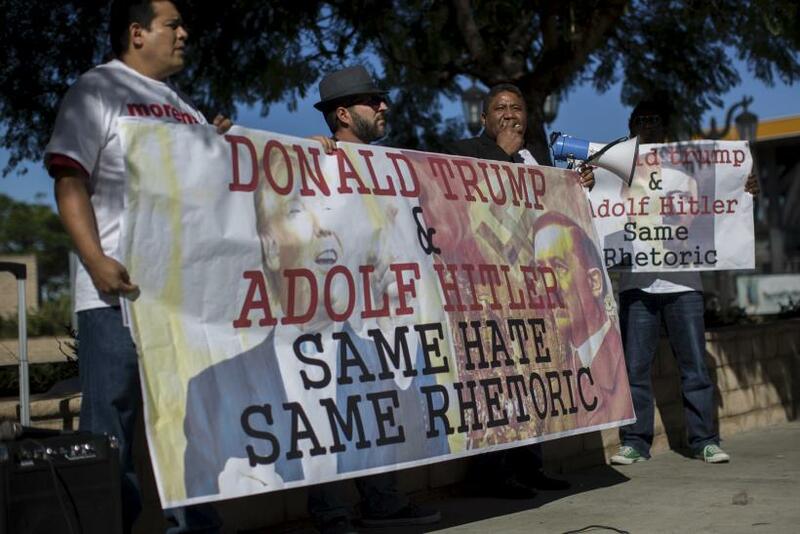 Immigration activists have criticized Trump’s stance on their issue and his use of language deemed insensitive to Mexican-Americans: They delivered a petition with more than 500,000 signatures protesting his appearance to an NBC executive. And the activist group Deport Racism has offered $5,000 to anybody in the “SNL” audience who yells either “Deport racism” or “Trump is a racist” during the show. Trump’s “SNL” gig also will trigger the FCC’s equal-time rule, which requires TV stations that allow political candidates free airtime to offer the same option to other candidates, Variety reported. Democratic presidential candidate Hillary Clinton’s appearance on “SNL” was also subject to the rule, although she appeared on air only for about 3 minutes. During that appearance, Clinton did her Trump impression. This will not be Trump’s first time hosting the popular sketch-comedy series. He hosted “SNL” about 11 years ago. Historically, an appearance on “Saturday Night Live” has done either little or nothing to better a candidate’s chances of becoming president: None of the six presidential candidates who hosted “Saturday Night Live” before Election Day ultimately won the race, BBC News reported. “SNL” has frequently lampooned Trump over the years, with several comedians impersonating the businessman, including show alums Jimmy Fallon and Darrell Hammond. Its latest mimic, Taran Killam, spoofed Trump Oct. 4, poking fun at his inflammatory comments about immigrants and women. Trump’s episode of “SNL” will air on NBC Saturday at 11:30 p.m. EST.